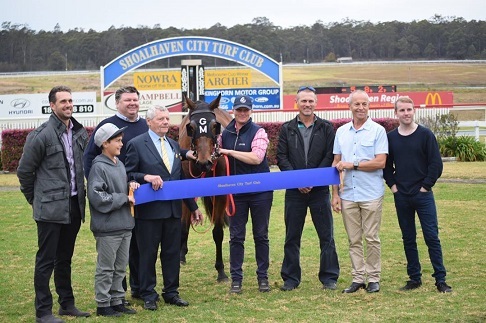 More than $12,000 has been raised for struggling farmers at Shoalhaven City Turf Club’s Great Day Out To Fight The Drought race meeting. All gate takings, donations from those in attendance, raffles and silent auctions contributed to this great result. In addition many people dropped off non-perishable items in the Fill Our Van With A Can promotion. “The generosity of people in the community was overwhelming,” SCTC CEO Lynn Locke said. “We had a great crowd and everyone was keen to raise funds to support the drought-affected farmers. “It was just amazing that people contacted the Club to volunteer their assistance so that we did not have to pay wages and could donate more to the farmers. “Even bookmaker Adrian Dowdell donated half of his winnings. Racing personality Richard Callander, jockey Tommy Berry and former AFL star Nick Davis jumped at the chance to support the Great Day Out To Fight The Drought. Punters were eager to meet them and happily donated $2 to the cause to have their photograph taken with trio. Nick Davis, Richard Callander and Tommy Berry with the winning connections of Bugeisha. Local entertainers provided by Jaybees Entertainment volunteered their time to perform at the races, creating a fantastic atmosphere. Purple Envy kicked off the day with their version of Eagle Rock before Jamie Parkinson & Rayner, Platinum Duo and Jeff Hill continued the toe-tapping line up. Children enjoyed free entertainment too including a jumping castle and the Archer Miniature Railway. The quality of racing was fantastic with strong fields and exciting finishes. Much to the crowd’s delight, local trainer Robert Price took out the first race prompting cheering from all on course. The newly renovated dining room played host to a wonderful group of businesses who all came on board to support the race day. Monies were raised from this group through their sponsorship, silent auction bidding, 200 Club and donations. “The idea, which was a joint venture with Hanlon Windows and the club, was to assist local farmers who lived within 100-150km of the Shoalhaven,” Lynn Locke said. “The Club will ensure that the money raised goes back into the community by purchasing vouchers at local businesses and distributing them to the farmers that have contacted us for support. The Shoalhaven City Turf Club would like to encourage other race clubs and organisations to assist the drought affected farmers. The highlight of the day was the fact that it poured rain last night. What a great finale to a wonderful event.